Kitchen! Kitchen! : homemade sardines by my sister Pearl...a tribute from... kitchen! kitchen! homemade sardines by my sister Pearl...a tribute from... kitchen! kitchen! into something delicious and so mouth watering. My sister made this homemade sardines when I was visiting in the Philippines. All of my sisters are a whiz in the kitchen in their own way. And when I was asked what I would like - a homemade sardines came to mind. I longed for the ones a few thousand miles away. kitchen equipment which is a must to do this recipe. The "PRESSURE COOKER"! I am very leery about this equipment. taking cover under a table. So, pardon me if I prefer to have my food on the table instead of on the ceiling. Up to now, I will not attempt to cook in one. 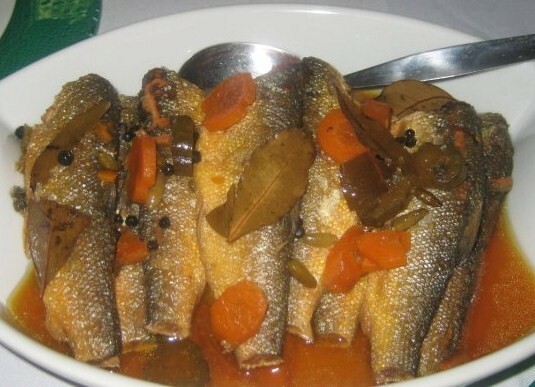 So, therefore, I will leave this home made sardines to my dear lovely sister, Pearl. to do is goggle for a recipe.